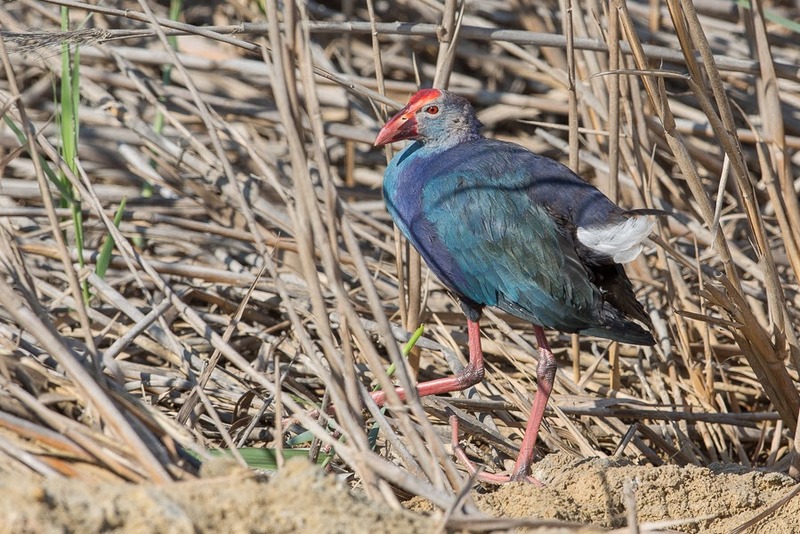 Whilst birding at Sabkhat Al Fasl I found a slightly different looking Purple Swamphen to the normal type we get. 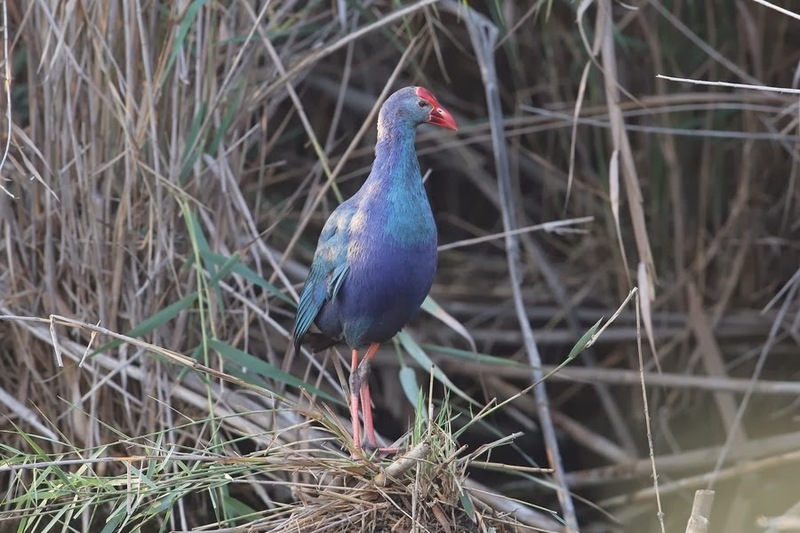 The Purple Swamphen that occurs in Saudi Arabia is of one of the grey headed eastern / Asian subspecies from the Porphyrio porphyrio poliocephalus group which are either Porphyrio porphyrio caspius or Porphyrio porphyrio seistanicus. P. p. poliocephalus is found from India and Sri Lanka to south China and north Thailand. It has cerulean blue scapulars, face throat and breast. P. p. caspius is from the Caspian Sea area, and is like P.p. poliocephalus, but is larger whereas P. p. seistanicus occurs from Iraq to Pakistan, and is like P.p. poliocephalus, but larger although smaller than P.p caspius. A number of birds have been identified as P. p. seistanicus in Kuwait, UAE and Qatar. The typical grey-headed type birds were present as always but there was also a blue-headed type. This is the second time I have seen this type which looks like a different sub-species to those we normally get. Trying to work out what sub-species birds belong to is very difficult unless birds are trapped and measured. 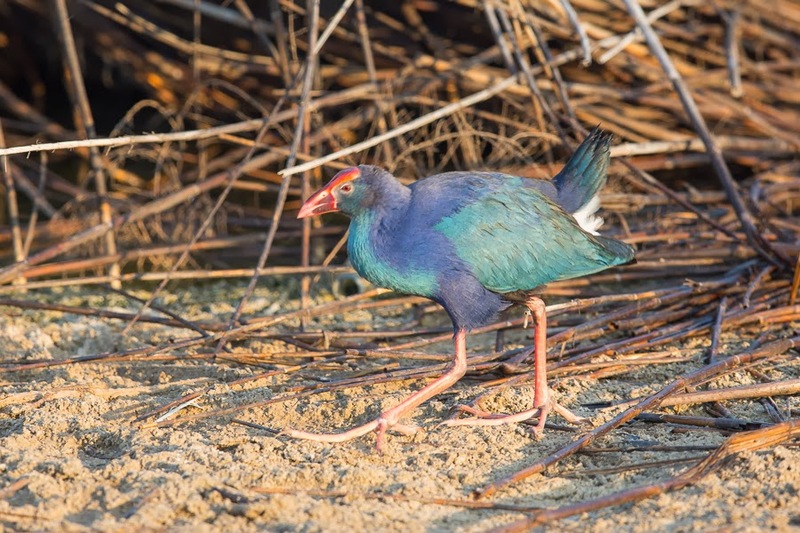 I also found a juvenile Purple Swamphen that indicates breeding has again been successful for the species at Sabkhat Al Fasl. 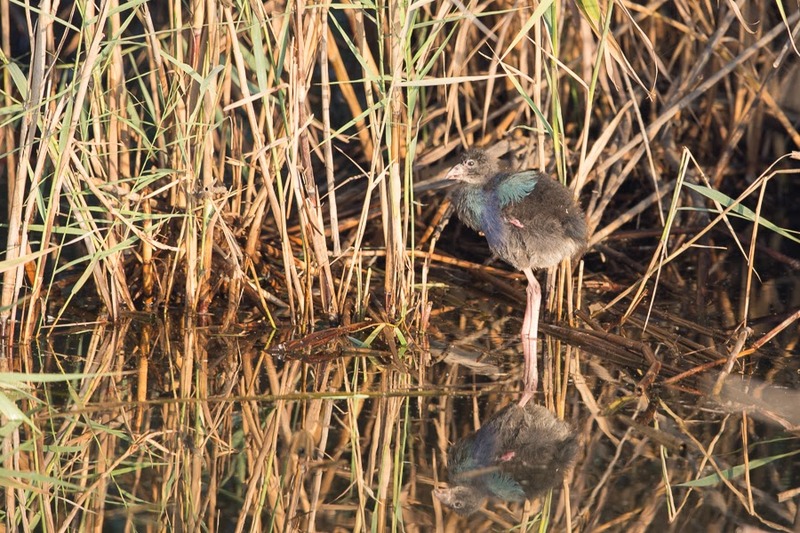 Bird numbers are increasing at the site and birds have started to spread to other nearby marshes such as Khafrah Marsh. There is slightly less disturbance now which has helped with the birds breeding successfully as they are easily disturbed and frightened. I was wondering if you can offer a tour for a group of two who are interested in birding? (myself and a friend).. I'd really like to see those birds and it's migration season.. so probably there's plenty of birds to watch in the Eastern province.. I was able to see some in a bird sanctuary in Bahrain, but I'm not sure what locations have them in the Eastern province. I hope you have seen my email on the topic of working with you on Bird Photography. I would like to acompany you on the trips within Eastern Saudi Arabia.